Miami Valley Today file photo Covington’s Lauren Christian was a state placer in both the shot put and discus last year and returns for her senior season. 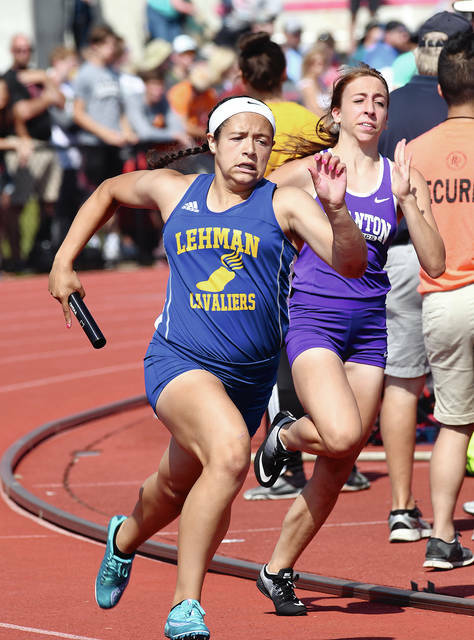 Mike Ullery | Miami Valley Today file photo Lauren McFarland is back for the Lehman Catholic from the 400 relay team that took second at the state meet last year. 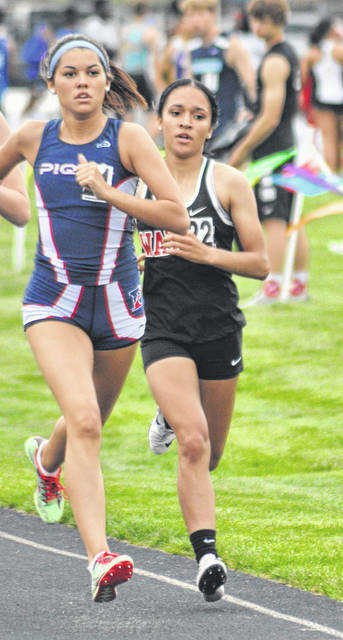 Rob Kiser | Miami Valley Today file photo Piqua’s Ellie Jones runs the 800 at the GWOC meet last year. Jones is back for the Piqua girls. 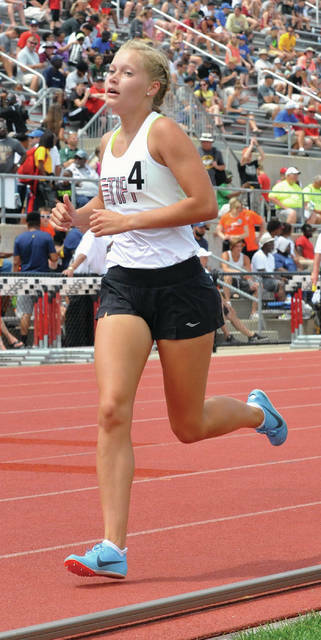 Josh Brown | Miami Valley Today file photo Tippecanoe’s Katie Tayor was a state placer in the 3,200 last season. 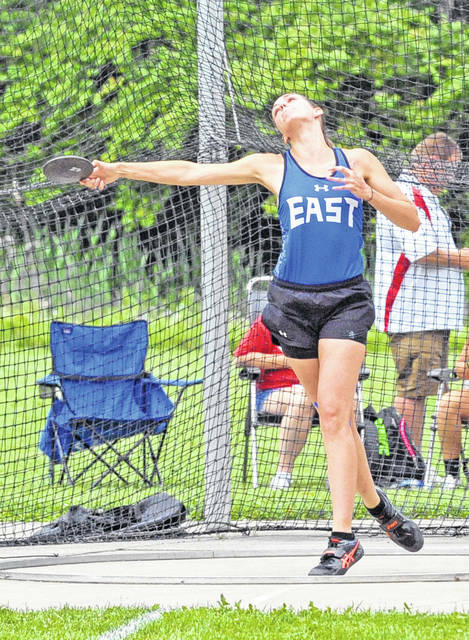 Josh Brown | Miami Valley Today file photo Miami East’s Rachel Ondera was a regional qualifier in the discus last season. Josh Brown | Miami Valley Today file photo Milton-Union’s Allison Freistler was a regional qualifier in the high jump last year. PIQUA — There’s a new — but familiar — face leading the program as Steve Frazier takes over as Piqua girls track and field coach. He has 35 years experience as assistant track coach for junior high and high school, as well as being former Piqua varsity cross country coach. Graduating off last year’s team were Kenzie Ellerman and Emily Powell. Returning letterwinners include seniors Claire Bim-Merle, Jaelin Bixler, Mary Craft, Jaelyn Furman, Kitte Lampe, Hailey McPherson and Skylar Sloan; juniors Ana Adams, Zoe Blankenship, Danielle Detter, Addelyn Honeycutt, Ellie Jones, Alexa Knorr-Sullivan, Lauren Mitchell, Jalynne Roberts and Rakaela Smith and sophomores Colleen Cox, Elora Dodds, Whitney Evans, Katherine Hanes, Jordan Karn, Veronica Keebler, Aly Sherman and Rhylee Tufts. “We should fare very well in every meet we go to with all the returning lettermen we have coming back this year and a very strong freshman class coming up,” Frazier said. COVINGTON — It was a dream season for the Covington girls track and field team last year, as the Buccaneers were the Division III state runner-up. Graduating off last year’s team are state champions Rayna Horner and Breanna Kimmel, along with Danielle Alexander, Kelsey Dysinger, Tori Lyle, Shae Robinson and Danielle Rose. Returning letterwinners include seniors Paige Boehringer and Lauren Christian, juniors Sarah Barnhart, Morgan Kimmel, Morgan Lowe and Maci White; and sophomores Sydney Hogue, Alyssa Kimmel, Kayla Mitchell, Tori Quinter and Ellery Reck. David Tobias returns for his 19th season as head coach. The Buccs still have some talented athletes. Tobias is hoping for a top three finish at the CCC meet, with five league champions. WEST MILTON — The Bulldogs will be looking to defend their Southwestern Buckeye League title this season. Seniors Haley Bloom, Kristin Dickison and Bri Collins, along with junior Rachel Thompson, will run the middle distances. Sprinters will be senior Ellie Cooper and Madelyn Johnson. Distance runners will be senior Kyli Parsons, along with freshmen Sophie Meredith and Maddie Stasiak. A pair of junior high jumpers, Allison Freistler and Ally Lyons, both were regional qualifiers last year. Sophomore long jumper Morgan Grudich also was a regional qualifier. TIPP CITY — Nick Culver takes over for long-time head coach Bob Crawford for the Red Devils this season. “It’s too early to tell with all the new faces, but I can see with the athletes that came out this year that I wouldn’t be surprised if we are in contention to win the (Greater Western Ohio Conference) North this year,” Culver said. Leading the way for the Red Devils is senior Katie Taylor, who placed seventh in the state last year in the 3,200. She and senior Kaili Titley have helped the Red Devils qualify for state in the 4×800 each of the past two seasons. Sophomore Mackenzie Dix qualified for regionals in the 1,600 last year and was part of the 4×800 team that qualified for state. Titley also will run sprints for the Red Devils and could compete in the 4×200, 4×400 and 4×800 relays. She’ll be joined in the springs by sophomore Jaila Fletcher. In the field events, the Red Devils return three throwers in senior Lauren Robbins and sophomores Savanna Dodd and Ashlyn Tarzinski. CASSTOWN — The Vikings should get a boost with the return of sprinter Gabrielle Hawkins, who missed last season with an ACL injury. Hawkins won a Cross County Conference championship and was a regional finalist in the 400 last year. She also qualified for the state indoor meet in the 400. Joining her in the sprints will be Ashlyn Monnin, Rachel Ondera, Liza Bair and Natalie Bair. Monnin, Natalie Bair and Paige Blauvelt will run middle distances. Liza Bair was a regional qualifier last year in the high jump, as was Ondera in the discus. Amber Kinnison returns in the shot put. TROY — The Eagles return a number of talented athletes. High jumper Kenley Blake placed fifth at regionals last year, just missing a trip to state. She’ll be joined by Sophie Pitsenbarger. Troy Christian’s long jumpers are Elizabeth Deal, a regional qualifier last year, and Brooke Dellinger. Blake also will run the sprints, as will Kirsten Strait and Kristen Rodrigues. The middle distance runners will be Gracie Glaser and Anna Hivner. BRANDT — Mark Clute returns for his fourth season as Bethel’s girls track and field coach. In the springs, regional qualifier Rachel Larson, a senior, returns in the 400. Also returning is the 4×200 team of Sophia Yarwick, Ashley Newton, Karissa Bui and Natalie Morman, which also qualified for regionals. Senior Kaitlyn Balkcom just missed qualifying for regionals in the 1,600 last season, and she returns. In the field events, junior Brielle Gatrell was a state indoor qualifier as a freshman, but battled through injuries last season. She’ll be joined in the high jump by sophomore Hayden Parson. Hannah Marzolf will throw the shot and discus. PLEASANT HILL — Nick Rhoades returns for his 11th year at Newton. Senior Maddie Hildebrand was injured last year, but will be a key sprinter this season. Senior Alicia Dunning returns in the high jump, while senior Morgan Robbins and sophomore Rylie Resides will compete in the pole vault. SIDNEY — Dwane Rowley is back for his 10th season as coach. Lehman won the NWCC title last year. Graduating off that team was four-time state placer Alanna O’Leary, who was the anchor leg on the 400 relay team that finished second at the D-III state meet. Back from that team are juniors Rylie McIver and Lauren McFarland and sophomore Lindsey Magoteaux. Also returning are senior Maria Schmiesing, juniors Kirstyn Lee and Sophia Flood and sophomore Samantha Clayton. “We have low numbers in participants and are young, but we look to be competitive in all meets and events,” Rowley said. “We return three of the four girls from our sprint relay that took second at state. We will look for them to be stronger, faster and score more points for our team. HOUSTON — Sharon Roeth takes over as coach. Graduating off last year’s team was Morgan Ely. Returning letterwinners include seniors Hollie Voisard, Becca Selanders, Shelby Ayers and Cassidy Mayse; juniors Kayla Huber, Hannah Hollinger and Alex Freytag; and sophomores Danielle Stephenson, Amber Stangel, Dara Gillem and Mariah Booher. “We are looking forward to a good season this year,” Roeth said. “We have good freshman talent coming in that will fit well with our upper classmen. Last year’s regional qualifiers Shelby Ayers, MacKenzie Wenrick and Hollie Voisard have their eyes on state, as well as cross country state qualifier Ava Knouff. “We will also focus on getting more individuals in regionals. We made good strides last year, with a winning record and want to use that momentum to build this year’s team. RUSSIA — Brad Heaton returns for his seventh season as coach. Graduating off last year’s team was Emily Bohman, who finished third in the D-IV state pole vault her junior year. Returning letterwinners include seniors Anna Fiessinger and Claire Meyer; juniors Alexus Booker and Sarah Pinchot; and sophomores Becca Seger, Kenzie Voisard and Natalie Klosterman. Heaton expects the SCAL to be strong as always. VERSAILLES — Sandy Mangen takes over as Versailles coach. She has 16 years of experience coaching track and field at Versailles. Last year, the Lady Tigers were MAC runnerup, district champion and regional runnerup. Graduating off that team were Kenia McEldowney, Cassie Peters, Ellen Peters, Megan Rismiller, Dana Rose, Danielle Nerderman and Kari Mangen. Returning letterwinners include seniors Tori Schulze, Liz Watren, Madison Ahrens and Ava Moran; juniors Jada Barlage, Hannah Bey, Emma Peters, Lucy Prakel, Ellie Barga, Avery McEldoney, Jaden Prenger and Olivia Waymire and sophomores Maria Mangen and Ali Moran. “We lost some great talent to graduation last year,” Mangen said. “But, we have a great group returning, which includes four state placers along with several regional qualifiers. We have a solid core for young team, that includes 25 underclassmen. Mangen is hoping for a top-four finish at the MAC meet. https://www.dailycall.com/wp-content/uploads/sites/30/2019/03/web1_lauren-christian.jpgMiami Valley Today file photo Covington’s Lauren Christian was a state placer in both the shot put and discus last year and returns for her senior season. https://www.dailycall.com/wp-content/uploads/sites/30/2019/03/web1_laurenmcfarland.jpgMike Ullery | Miami Valley Today file photo Lauren McFarland is back for the Lehman Catholic from the 400 relay team that took second at the state meet last year. https://www.dailycall.com/wp-content/uploads/sites/30/2019/03/web1_jones.jpgRob Kiser | Miami Valley Today file photo Piqua’s Ellie Jones runs the 800 at the GWOC meet last year. Jones is back for the Piqua girls. https://www.dailycall.com/wp-content/uploads/sites/30/2019/03/web1_060218jb_tipp_taylor-2.jpgJosh Brown | Miami Valley Today file photo Tippecanoe’s Katie Tayor was a state placer in the 3,200 last season. https://www.dailycall.com/wp-content/uploads/sites/30/2019/03/web1_052618jb_me_ondera.jpgJosh Brown | Miami Valley Today file photo Miami East’s Rachel Ondera was a regional qualifier in the discus last season. 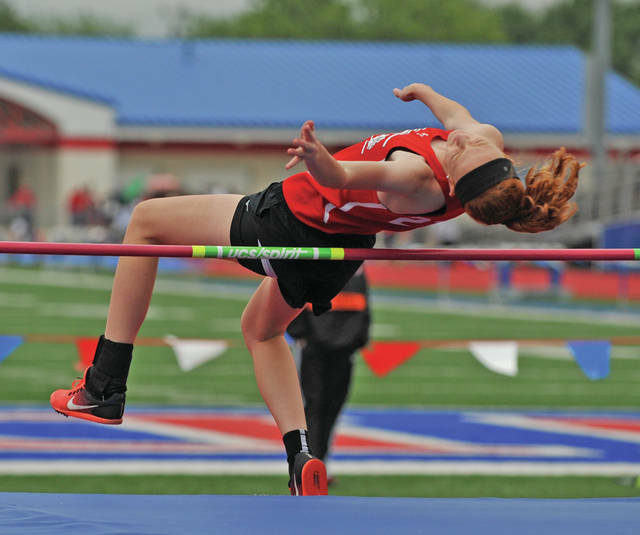 https://www.dailycall.com/wp-content/uploads/sites/30/2019/03/web1_052617jb_freistler.jpgJosh Brown | Miami Valley Today file photo Milton-Union’s Allison Freistler was a regional qualifier in the high jump last year.